RENT 'N' RAVE EQUIPMENT LTD. 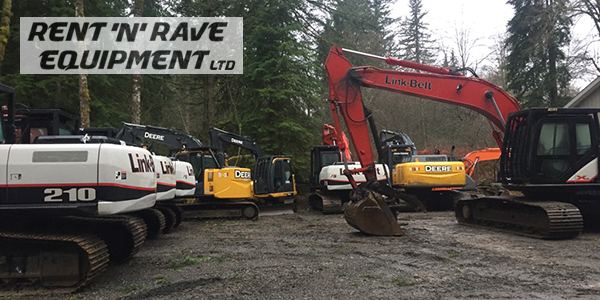 Supplying Excavator and Rock Truck rentals in the Vancouver & Fraser Valley/Lower Mainland areas since 2005 to contractors, landscapers and homeowners. Providing mini, mid or full size Excavator rentals, Rock truck rentals, and small Kubota track dumper rentals. Our excavators all have enclosed cabs with heaters and window wipers. The rental excavators have hydraulic thumbs for picking up rocks, stumps and demolition material. The mid sized and all the full size machines have cab guarding protection as well. Each excavator has a quick change system and 2 buckets. One narrow digging bucket with teeth, good for trenching and hard ground. One smooth cleanup bucket with no teeth - for final grading and bulk material handling. Mini-excavators are one of the most common pieces of equipment on almost all earth moving landscaping sites and residential property projects. The machines ability to operate in tight areas combined with low ground pressure weights make mini-excavators an excellent choice for projects where hand labor is too slow or costly. They are useful for small excavations, yard leveling, brush and debris removal, preparation for driveways, wood and rock retaining walls, trenching and drainage. They can also spread sand, gravel or topsoil with the front dozer blades. Many land owners find them useful for maintaining fence lines and building nature trails on their properties. The rubber tracks reduce damage to existing concrete sidewalks, curbs or driveways.